The Borzoi (or Russian Wolfhound) originated in Russia and was bred as a hunting dog, using its excellent speed and sight to chase and run down foxes, hares and wolves. The agility and strength of the Borzoi lent itself perfectly to the great hunting traditions of the Russian aristocracy. 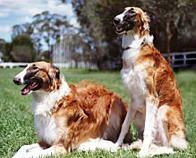 The first Borzoi was exported to Australia in 1898. 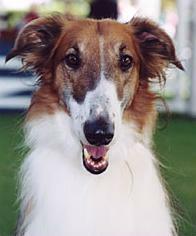 This unique animal normally lives to 10 years of age, but Borzois have been known to live up to 12 years of age when fed the correct nutrition. 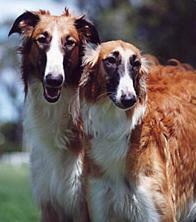 The Borzoi is usually a calm and sensitive, gentle giant that responds well to a loving owner. A reserved and dignified breed, it is not suited to rough handling or aggressive training. As with many other dogs, this breed will benefit from basic obedience training. Borzois need to be handled sensitively, and any children with whom this breed is to live, must be taught to handle the dog quietly and sensibly. Although a Borzoi loves to run and enjoys frequent walks, it is also happy to find a comfortable bed or place in the back yard and rest quietly. This breed is adept at finding the most comfortable position in the house for a nap - quite frequently your bed - it is best not to encourage this behaviour. When properly socialised as puppies, Borzois can live amicably with other pets in your household. It is important to remember, however, that the Borzoi was bred to chase running game, and that care should be taken with cats and other small animals when in the back yard or out walking. Borzois are surprisingly small eaters for their size and only eat about the same amount of food as a medium-sized dog. As well as being fed a high quality balanced diet, a Borzoi enjoys chewing large bones, particularly when left alone for periods of time. The Borzoi coat is easy to maintain. Brushing several times a week and bathing regularly will keep the coat clean and assist with flea control. A primary part of Borzoi care is the importance of regular exercise. These dogs need to visit open spaces such as parks or the beach, where they can be exercised "off leash". It is vital for the physical and mental wellbeing of this breed that regular exercise be maintained. Ideally, the Borzoi needs a large back yard, although this can be compensated for with long daily walks. As with all dogs, the Borzoi requires regular veterinary checks and lots of loving care. Borzois are agile dogs that need adequate fencing in order to keep them safely enclosed, particularly in the city. Similar to other large dogs, Borzois are occasionally prone to "bloat". Consult the breeder of your dog or your vet for additional information. Although this breed is quite capable of undertaking basic obedience training, it is generally not responsive to specialist training. The ideal owner of this breed is someone who regularly takes their dog for long walks, but is happy to have a couch potato at home! Borzois are not suited to rough play or being physically reprimanded and respond better to owners who employ calm vocal discipline. A loving owner will be rewarded with great affection by this devoted breed.